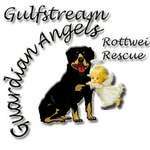 Gulfstream Guardian Angel Rottweiler Rescue hasn't added a story. Chelsea was a stray brought into Hillsborough County Shelter. The shelter noticed she wasn't putting any weight on her back leg. Unfortuntately , Chelsea developed URI and was moved to isolation area of the shelter. So she did not get any exposure for adoption. Also having a bum leg , gave her two strikes against her. Foruntately , the shelter contacted GGARR , our volunteers Uli and Dave went to assess her and take pics for Grace , who later on approved for us to take her in. Chelsea needs help with her surgeryon her hip. Please consider donating 5...10.. or 20 towards her surgery. She deserves a 2nd chance. Gulfstream Guardian Angel Rottweiler Rescue hasn't posted any updates yet. Gulfstream Guardian Angel Rottweiler Rescue is managing the funds for this campaign.